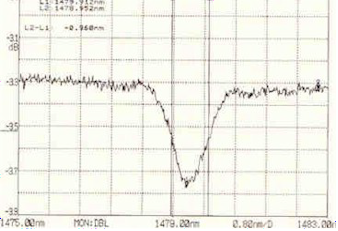 In many applications, the wavelength of a pump laser diode needs to be stabilized during operation. Fibre Bragg gratings are a simple and good approach for locking the wavelength of the pump laser diode. Fibre gratings are also a simple and efficient approach to stabilize the wavelength of any laser diode device. We can offer fiber gratings for 980 nm pumping laser diodes (model number OEFGS-980 and 1480nm pumping laser diodes (model number OEFGS-148). We are also capable of writing the fiber gratings for 850 nm laser diodes and other wavelength laser diodes. The fiber grating forms an external cavity and reflects a very small part of the signal to act as a feedback thus stabilizing the pump wavelength. We also provide laser diode stabilizers with lensed fibres to provide complete solutions for 1480 nm pump lasers and 980 nm pump laser package. Other processes like AR coating, ferrule mounting, fiber tip metallization and connectorization can also be done in-house. Usually the 1480 nm pump laser will use conical lensed fiber to couple the laser diode and the 980 nm pump laser will use wedged lensed fibre to do the coupling. For more information on lensed fibres, please go the lensed fiber page. External cavity fibre gratings can also narrow the width of the laser diode spectrum, by properly designing the laser diode. We provide fibre gratings for laser external cavities with central wavelengths from 600 nm to 2000 nm. 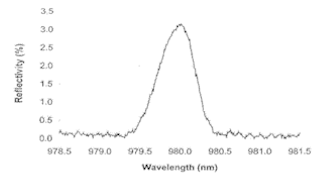 The bandwidth can vary from 0.02 nm to 2 nm, and the reflectivity from 0.3% to 90%.